The TCT Awards 2018 returns to the Hilton Metropole Birmingham on Wednesday 26 September 2018 to showcase the achievements of companies, individuals and new technologies in the additive manufacturing (AM) industry. 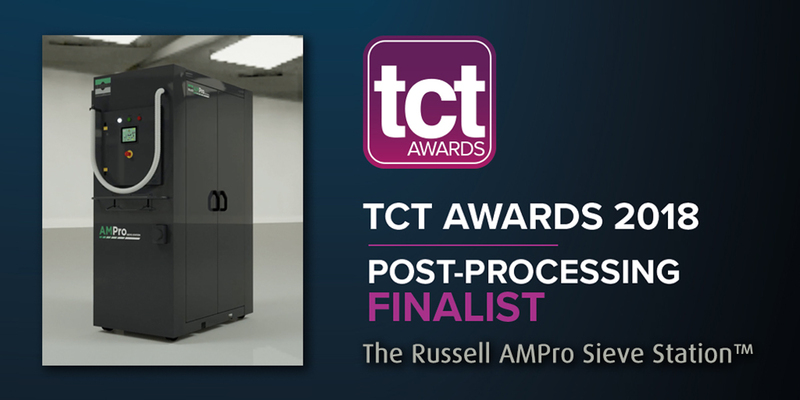 Russell Finex is delighted to have been selected as a finalist in the Post Processing Award category for the development of the Russell AMPro Sieve Station™. Russell Finex has been serving the AM industry since its beginning, supplying sieving systems to a wide range of AM technology manufacturers and end-users. However, with the recent evolution of the industry there is a need for the post processing requalification of powders to be made more robust and reliable. Russell Finex has developed a post processing AM powder recovery solution, allowing the industry to have confidence resolving the challenges faced with this part of the printing process. Knowledge of the Russell AMPro Sieve Station™ is already growing throughout the industry, with the system being recognised as the go-to solution to reclaiming and requalifying AM powders. Due to the speed of evolution of the market, new challenges and requirements are constantly emerging, meaning Russell Finex will continue to work with key partners to further develop the system to meet their needs. The Russell AMPro Sieve Station™ will enable the AM industry to further advance in terms of powder quality and re-using AM powders post-production. Without it the industry would continue to face serious challenges with powder management and operator safety. Manufacturers cannot compromise on quality, and with customers demanding to work with companies who can guarantee a reliable, repeatable process for parts, reputations rely upon the powders used. Due to these challenges, an awareness has been built within the market of the need for this type of post processing powder recovery system. The key to anchoring this awareness will be ensuring manufacturers and end users understand exactly how the Russell AMPro Sieve Station™ specifically benefits their additive manufacturing processes, through its headline features. The unit has also been designed to evacuate and recondition powders from the build chamber or connect directly to 3D printing technology to allow a fully-automated closed-loop post-production powder recovery process. What makes this system so unique is how every element has been carefully designed and incorporated into one system resulting in a fully-automated process. An intuitive interactive user interface brings together all elements of the system and allows for one-button, fully programmable operation which minimizes operator involvement. An intelligent feed and flow management system enables a controlled feed to automate and optimize the sieve operation, and an intelligent weight system allows complete automation from start to finish. Since its establishment in 1934, Russell Finex has enjoyed steady, strategic growth ensuring the reputation of a global leader in the design and manufacture of innovative separation technology. Russell Finex would like to congratulate and wish the best of luck to all 2018 TCT Awards Finalists.